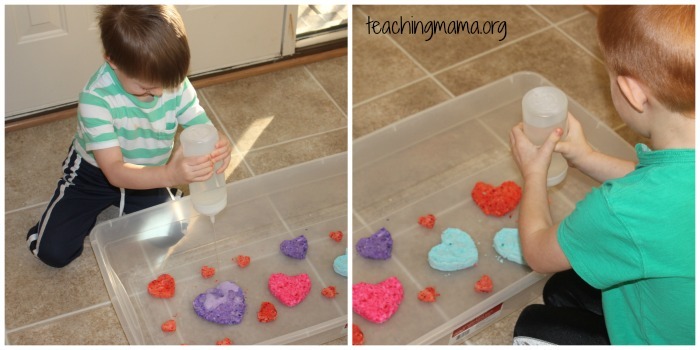 This fizzing hearts activity is sure to bring a smile to your little one’s face! My boys like any activity that involves something fizzy, and this was no exception. 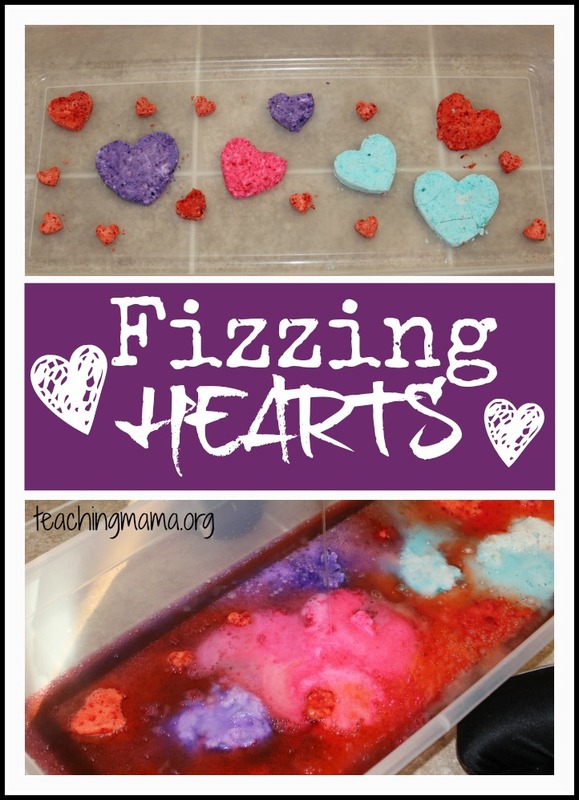 This fizzing hearts activity is a great activity for Valentine’s Day or really any day of the year! 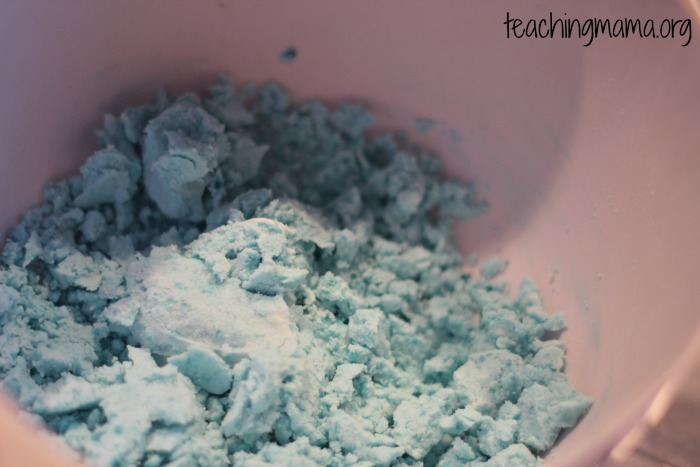 To start, mix the 1/2 cup of baking soda with the 2 tablespoons of water. 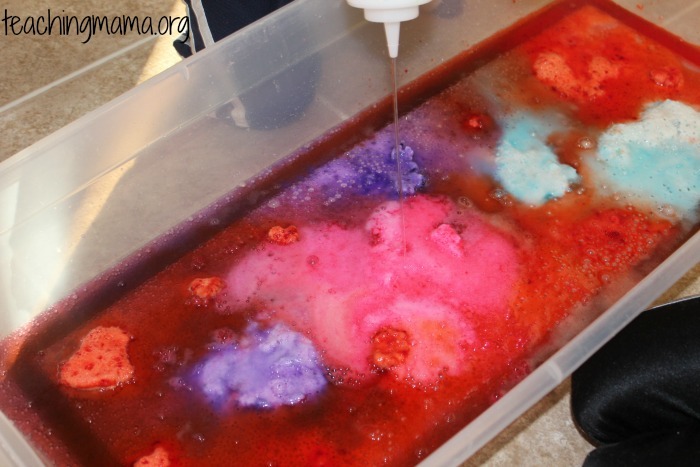 Next, drop in a few drops of food coloring. 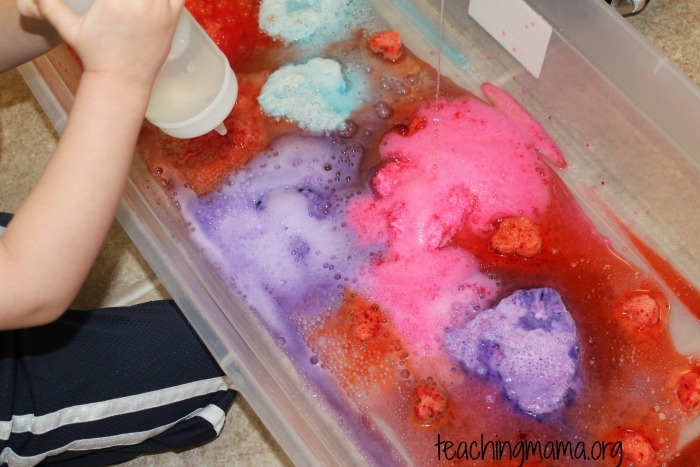 I used gel food coloring for purple, pink, and red and liquid food coloring for blue. 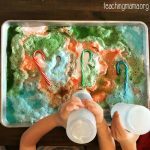 You can mix with a spoon or with your hands. Just be aware that you may get food coloring on your hands. The mixture should be slightly wet, yet crumbly. If it’s too wet, just add a bit more baking soda. It should look something like this. You can make more dough if you want more hearts. The above measurements were used for each color I made. 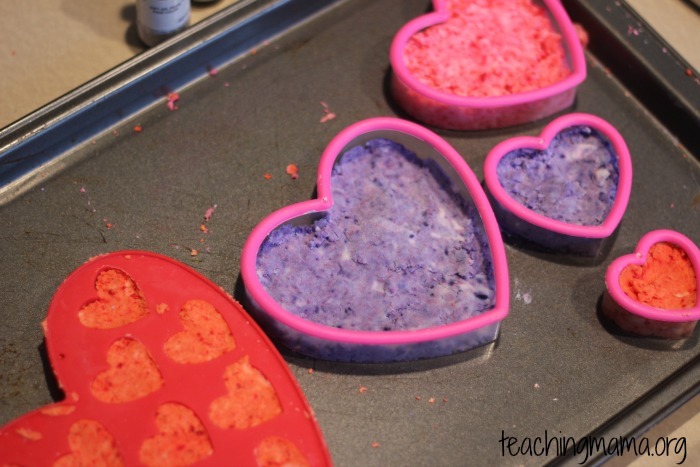 Next, place the dough in a mold, like a cookie cutter or silicone mold. You can also just make a ball with the dough. Then, place them in the freezer for about 30 minutes. That helps the dough form together better. Next, put the hearts into a large container. 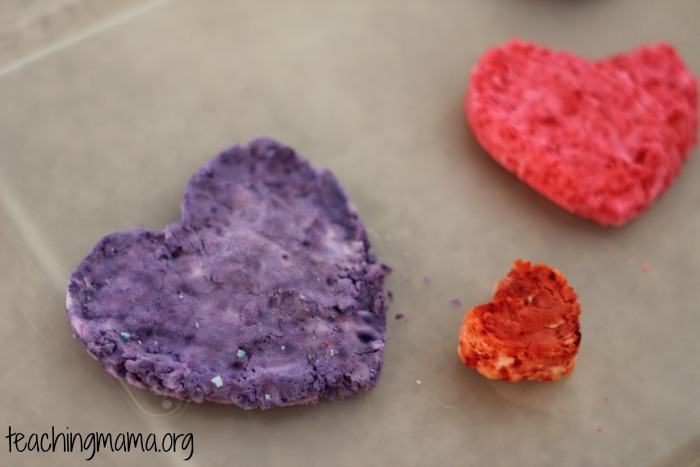 I love these happy, colorful hearts! Then it’s time for the fizzy fun! 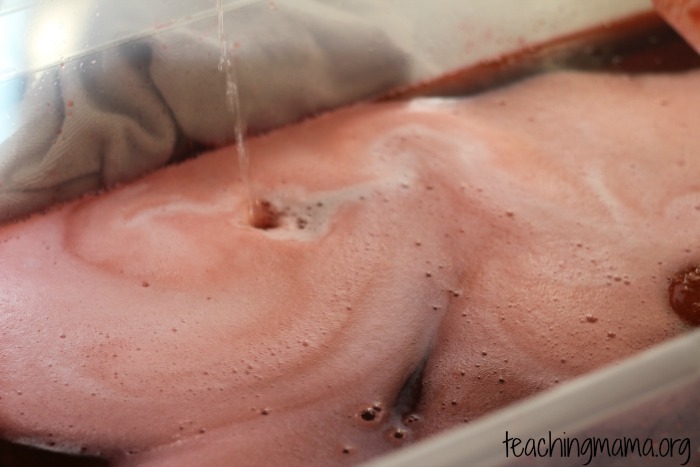 I put vinegar in squeeze bottles and let my boys squirt at the hearts! 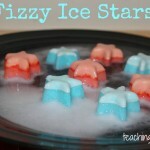 Lots of fizzy fun and lots of laughter during this activity! It was actually really fun to listen to the reaction. It sounded so fizzy and lots of “hissing” sounds! The fizzing lasted for a long time. We filled up their bottles 3 times each and they kept squirting and making more bubbles. 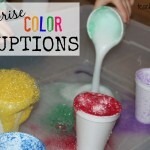 Then we got out wooden spoons and mixed it all up into a foam. 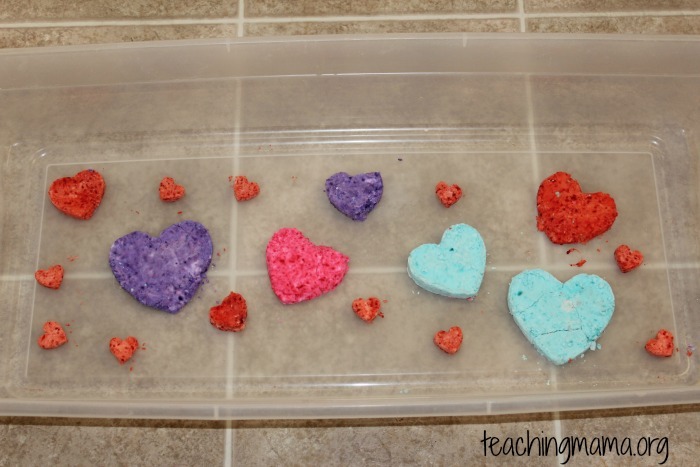 We loved this fizzing hearts activity and hope you’ll give it a try! This was day 17 of the 31 Days of Play series. 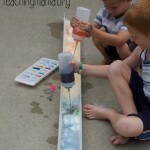 To see all the play activities, visit here. 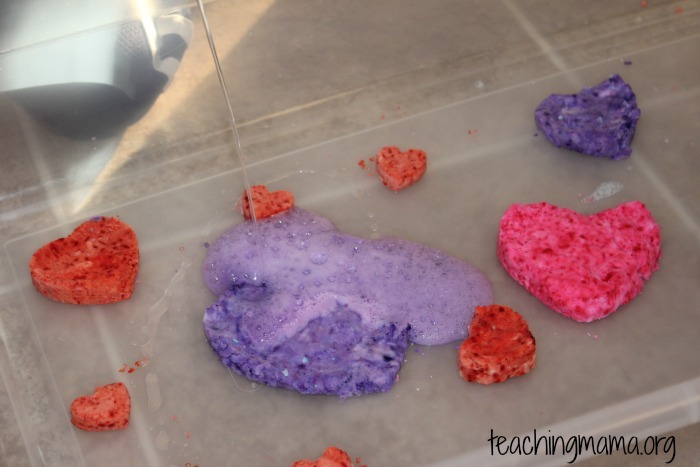 I think I love fizzy play more than my kids. Your kids look like they are having a lot of fun. 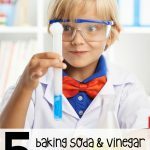 My kids love playing with baking soda and vinegar what a great twist on a fun activity for kids. What fun! My daughter would love to play with that. 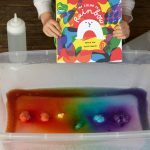 Just did this with my boys (3.5 yrs) and they loved it. They played for a whole hour (amazing!) and were pretending it was ‘whizz away ointment’ from the Magic Faraway Tree stories. Thank-you! My child and I did this today. I love it! My son was super focused while doing it. Thanks for this. 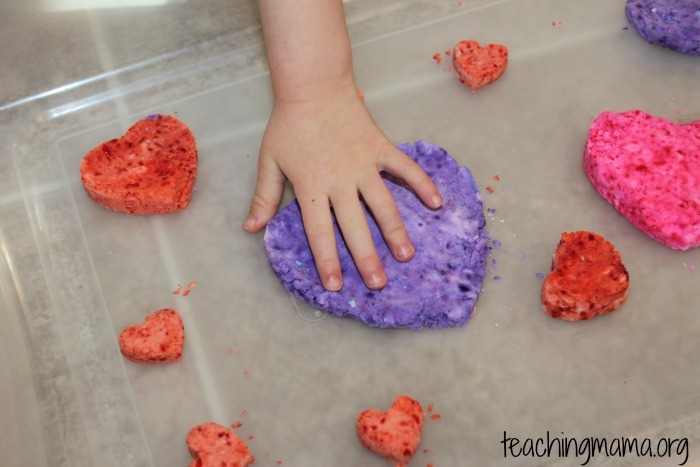 We did the Fizzy hearts activity today and we all had a blast!! 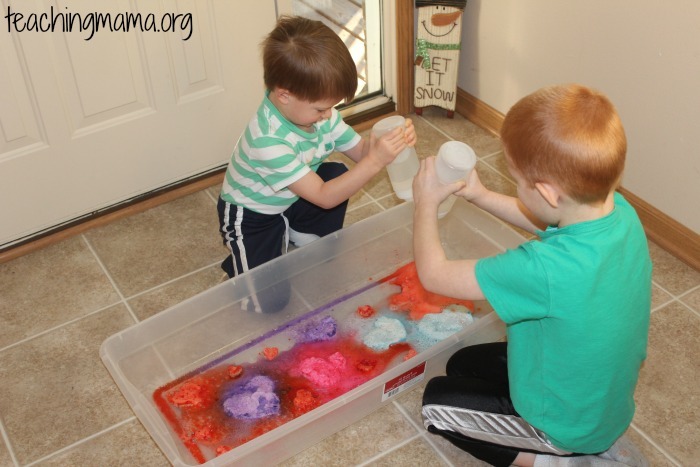 Thanks for sharing so many wonderful activities and sharing your unique abilities! !